Cockles live in heart-shaped, furrowed shells. When uncooked, the flesh inside has an oyster-like sliminess, but it only takes a little blast of boiling water or hot steam for the inside to turn solid and orange - not unlike a mussel. Cockles are found in estuaries round the British coastline. They lie a couple of inches beneath the sand and are hand-picked at low tide. The size and colour of cockles varies widely, dependent on where they come from. Cockles from The Orkney Islands, for example, are large and cream-coloured, while cockles from the south coast are generally smaller and a darker grey. For centuries, cockles haven't been considered a particularly prized shellfish. They're thought of as a cockney staple, or perhaps associated with Molly Malone - the fictional fishmonger's daughter in the Irish ditty 'Cockles and Mussels'. More and more though, cockles are creeping into Michelin-style dining, often used as a shellfish garnish to accompany something like monkfish or turbot. 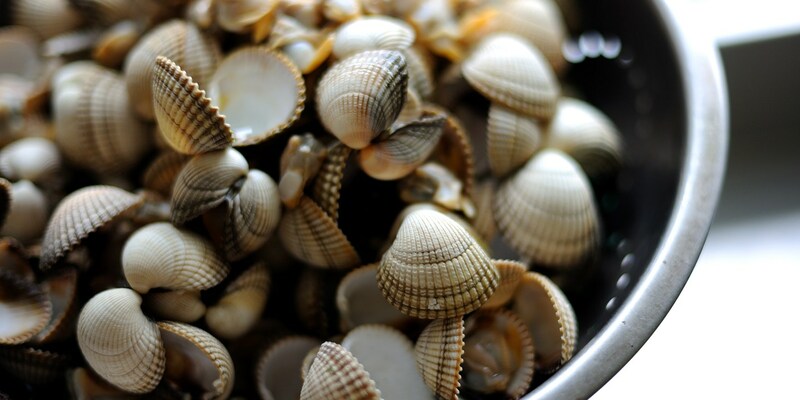 Cockles are low fat, high in protein and sustainable. There is a regulated season though, which starts in late June or July. Cocklers must hold a licence, and they should use sieves to make sure that they don't collect any cockles smaller than the required landing size. During the summer months, cockles are widely-available at fishmongers, and coastal farmers markets. Toward the end of the season, they are often pickled as a form of preservation, meaning that jars of cockles are available in specialist shops and large supermarkets all year round. Like mussels, cockles should be live at the point of purchase. They should smell fresh, and the shells should be closed. If any of the cockle shells are open, then give them a good tap against a hard surface. This should encourage it to close - if it remains open, then discard the cockle. Before cooking, firstly give them a rinse to wash away any sand or dirt. To steam them, pick a large pan with a lid. Bring a cup of water to the boil and add a splash of lemon juice or white wine vinegar. Place the cockles in the pan, and cover. It will only take a couple of minutes for them to cook, and then shells to spring open. The orange cockle inside can then easily be picked out and eaten. Cockles are often thought of as being a kind of shellfish garnish, served alongside something like a pan-fried fillet of fish. Their use shouldn't be restricted to seafood though. Chef Adam Simmonds, for example, pairs cockles with veal sweetbreads. And chef Phil Fanning, demonstrates how beer-braised cockles can enhance aLancashire Hot Pot. After all, if beef and oysters are a common pairing, then why not lamb and cockles? Shaun Rankin's recipe for Cockles cooked in white wine with shallots, pancetta and basil demonstrates what a delight simply-cooked cockles can be. Cockles shouldn't be paired with anything too heavy, like a cheese sauce. If, for example, they are being tossed in pasta, then a glug of olive oil, a squeeze of lemon, and a pinch of fresh herbs is often enough to showcase the cockles at their best.